Arsenic occurs naturally in rocks and soil, water, air, and plants and animals. According to the USEPA, it can be further released into the environment through natural activities such as volcanic action, erosion of rocks and forest fires, or through human actions. High arsenic levels can also come from certain fertilizers and animal feeding operations. Industry practices such as copper smelting, mining and coal burning also contribute to arsenic in our environment. Higher levels of arsenic tend to be found more in ground water sources than in surface water sources (i.e., lakes and rivers) of drinking water. Arsenic is odorless and tasteless. It is found in two forms or species: Arsenic III & Arsenic V.
For drinking water high in arsenic, distillers can provide a reliable and consistent method to remove both of these species. Reverse osmosis is also used but works better when the water has been pre-chlorinated or ozonated so that any Arsenic III in water has been converted to Arsenic V before the reverse osmosis system. For small point of use drinking water applications, we offer AdEdge DWS-2S point-of-use arsenic specific filter systems that can easily installed under the kitchen sink for point-of-use drinking water. These systems use the Adedge high capacity iron oxide-based media. Filters contain AdEdge AD33 and remove both Arsenic III and Arsenic V.
For whole house treatment, or for small communities, we prefer to use the Metsorb titanium dioxide systems which last longer and require less maintenance than the iron-oxide media systems. See our Whole House Arsenic Systems Here. Heavy duty backwash control valve features fully adjustable backwash and rinses cycles, saving water and allowing maximized performance. Time-tested, hydraulically balanced piston seal and spacers, providing years of trouble-free service. Precise Monitoring of water usage allows you to change out arsenic media after a predetermined number of gallons has passed through the system! Low backwash flow rate, uses very little wastewater compared to other systems. Backwash can be set for only once every 2 weeks. Recommended pretreatment: Pre-Filter with 5/50 dual-grade micron filter to eliminate any fine sediment in water before Arsenic System. If iron or manganese is present, reduce iron to less than 0.3 PPM and reduce manganese to less than 0.04 PPM with a Pro-OX Iron Filter System. Want More Information? See fact sheet from EPA on arsenic in drinking water. 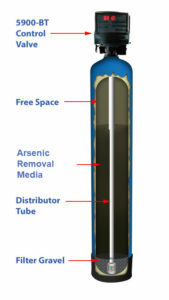 Test your well water for arsenic.